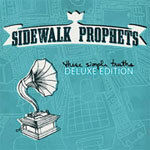 After a very impressive debut as a new artist, four Dove Award nominations, including a win for New Artist of the Year in 2010, several hit singles at Christian radio, and a project that has scanned over 100,000 units, Sidewalk Prophets has much to be grateful for. They've logged many miles in their "Van Gogh", bringing their signature sound to stages across the country. With very direct, vertical lyrics, songs like "The Words I Would Say", "You Can Have Me", and "You Love Me Anyway", are reaching people with their poignant messages and themes of grace and redemption. On this deluxe edition of their 2009 debut, These Simple Truths, listeners will hear one NEW song, along with acoustic versions of two favourites. 2010 Dove Award New Artist of the Year. Four-time Dove Award nominated including Group of the Year and Pop Contemporary Song of the Year. One of the best-selling new artists released in 2009. Over 100,000 units sold of debut project, These Simple Truths (8/25/09). Participated in major tours like Winter Jam and Rock & Worship Roadshow, and toured with artists such as MercyMe, Newsboys, Third Day, Francesca Battistelli, David Crowder*Band, Tenth Avenue North and Fireflight. Partnership with American Bible Society.